The Kwid made a big splash when it debuted back in 2015. The 2018 updates, though, are more of a ripple on the surface. But do these ripples have the potential to form a big wave with buyers? The Kwid’s seen a number of changes over the years with a larger 1.0-litre engine and then an AMT being added into the mix along the way. It also featured segment firsts like a touchscreen infotainment system, digital infotainment cluster and SUV looks. This time around, though, the updates are rather small. So, let’s list out the number of changes Renault have made to the 2018 Kwid lineup. 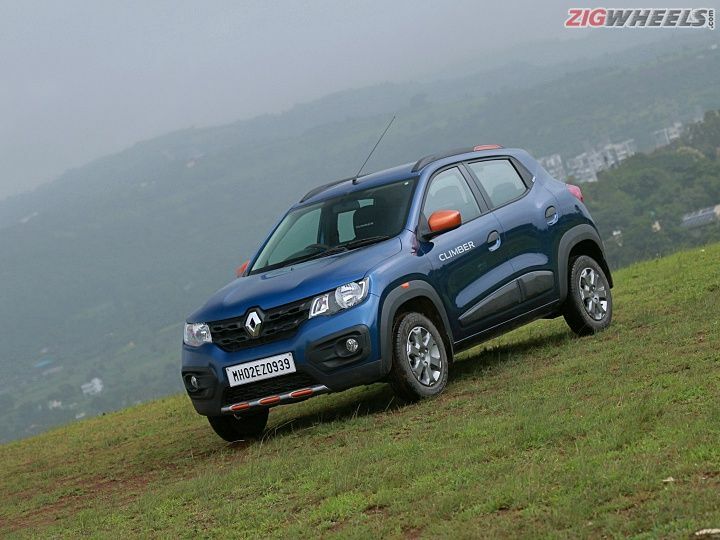 Not much has changed in the looks department with Renault adding a new chrome garnish to the top portion of the grill on the top-end Kwid and a new sticker for the side cladding on the 1.0-litre variants. The Climber that you see in the pictures has actually received no external changes at all. The changes to the 2018 Kwid are focussed mostly on the rear passengers. There is a new dropdown armrest for the rear bench, while the RXT(O) and the Climber get a new 12V charge socket on the rear parcel tray. The other change to the rear is the addition of ELR (Emergency retractable seatbelts) or what we know as regular seatbelts for rear passengers, across the range. These replace the manually adjustable fixed seatbelts from before. At the front, the only change is to the touchscreen infotainment in the Climber and the RXT(O), that will now display feed from the new reversing camera that has also been added to the features list of the 2018 Kwid. While the space hasn’t changed, it’s manageable and a lot more comfortable for two passengers, with the addition of the rear armrest. With the addition of the rear charge socket, your kids will also love the fact that they don't have to fight you for the front charge socket to charge iPads and gaming phones. And that sums up the changes to the interior experience with the new Kwid Climber. With the new changes to the rear, the Climber has gotten a lot safer than before. Its front seatbelts feature more advanced Pro-Sense pretensioner, load limiting seatbelts and regular ELR seatbelts at the rear. It offers a driver airbag in both, the Climber and the RXT(O) but this is fairly on par for the segment, till the government decides to pass new regulations that will mandate ABS and dual airbags as standard equipment on all new cars. The addition of the creep function to the easyR transmission really compliments the drive experience. Pulling away from a standstill is a much less jerky affair and the Kwid does not lurch forward as before, when you get on the throttle. So tackling bumper-to-bumper traffic is much less stressful and novice drivers will be thankful for the update. But that’s not the only area that has been affected with the new creep function. Gearshifts, and even getting on and off the throttle while the car is moving has become a lot smoother as well. This is because the creep function automatically adds just a hint of throttle and hence, there is much less drivetrain lash (a phenomenon that occurs when the drivetrain is loaded and unloaded) and in turn, the driving experience is all the more calmer. The creep function, however, is not to be confused with a hill-hold function. And while the car does creep forward in traffic as advertised, it won’t do the same on an incline. You will still need to use the handbrake to prevent the car from rolling backwards as you climb away from a standstill on a slope. While these changes are more like a ripple than a big wave, Renault has addressed some of the glaring omissions to the Kwid, like the manually adjustable rear seat belts and the missing creep function on the AMT. It also, again, brings buyers in this segment, firsts like the reverse parking camera and the rear armrest. When you take into consideration that Renault hasn't increased the price [Prices range between Rs 2.67 - Rs 4.59 lakh (ex-showroom Delhi)], the Kwid has just become an even more youthful and attractive prospect.